The David and Fela Shapell Family Institute for Preclinical Studies was created as a source of grant funding for scientists working with the Grand Israel National Center for Personalized Medicine (G-INCPM). It is designed to facilitate the development of innovative models needed to advance scientists’ understanding of biological systems, and to achieve the lab-based discoveries that will have a positive impact on human health. 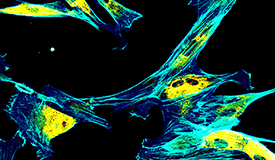 Activating the synergetic potential of the vast and varied technical infrastructure available at the G-INCPM, the Shapell Family Institute for Preclinical Studies supports scientists’ investigative work related to health and disease, by promoting the emergence of powerful new approaches and experimental platforms.